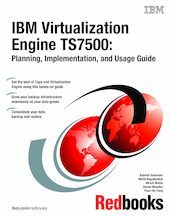 This IBM® Redbooks® publication describes IBM Virtualization Engine™ TS7500 and helps you plan, implement, and use the TS7500. This version of the book has been updated with the latest enhancements to the TS7520 and now also includes the TS7530 functions and features. This books is intended for system programmers, storage administrators, hardware and software planners, and other IT personnel involved in planning, implementing, and operating the TS7500 Virtualization Engine as well as anyone seeking detailed technical information about the TS7520 and the TS7530 versions of the Virtualization Engine.